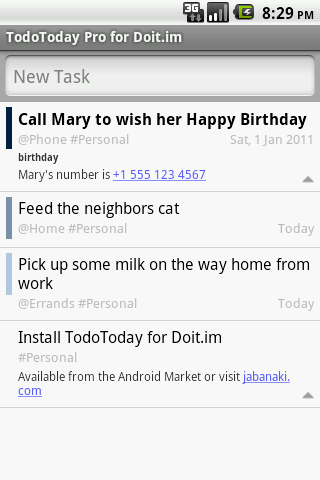 TodoToday for Doit.im is now out of Beta, and the new 1.0.0 version has been released to the Android Market. TodoToday for Doit.im is now available as both a free, ad supported release, and a new paid 'Pro' version with additional features. New in 1.0.0 is the ability to enter new tasks and actions to update existing tasks. By default TodoToday will now show all active tasks. A new settings option can be configured to reduce the number of tasks that are fetched and displayed. Add new tasks using a smart add style syntax to include due date, project, context and priority in the task entry e.g. "Call John tomorrow #Personal @Phone !2"
Users upgrading from the Beta will need to enable the Task Entry option in the Settings.